After a lot of practice finally I did it !!! Pretty sweet! Your string looks long. Can you play 1D, 2D, 3D, 4D, and 5D all with the same string, or do you have different string lengths for each one? Is the surprise the new MB carbon handsticks? and about the trick...its nice,but i think i saw it before! PS:when will be the 4d sun? I dont wanna sound like a d*ck. But i personally didnt like this. I think your string is overly long and just makes your style looks messy. I dont get why you have it so long, i can understand having slightly longer string for 4D but i think youve taken that a bit to far and its ruining your style. Also this trick isnt really that great at all, im pretty sure its been done before and its not hard to do. After other videos ive seen from i have to say i was disappointed with this one, with your insane technical ability you should be able to pull off much cooler stuff that this. I hope i dont start a flame war here, this is just my opinion. Something I noticed: as your string has gotten longer and longer and your high pattern gotten lower, your "high" pattern has technically turned into a "low" pattern I believe. With string that long (compared to your arm length) it's at a length where I believe you are unable to fully straighten the string (or maybe you just can, I can't tell). Normally that would make catching a diabolo hard since the string would be loose. However, you seem to get around that by lowering the pattern to a level where you never have an empty string. 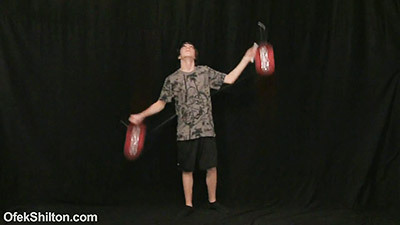 When one diabolo hits the string there is still another diabolo on the string just leaving. This keeps the string taught and facilitates catching the next diabolo. It's sort of an in-between pattern. I wonder how much this contributes to having a super stable pattern? I've always found that the longer the string (and hence the longer each diabolo is on the string) the more stable my pattern. I've just never taken it to such an extreme. Assuming your 4 pattern is similar to this 3 pattern, your 4 high pattern may technically be a 4 low pattern. That is if we define a low pattern as a pattern where there are multiple diabolos on the string at one time. I guess your pattern sort of defies traditional definitions. Short string is where it's at! Using a long string makes me feel incapable, compared to short string. The issue with string length is more control vs more room (to a certain extent). Then again, it makes sense to use a long string (more room in your string) if you're focussing mainly on 3 and 4 diabolo stuff. well done on the trick, but i have to agree with dodson, your style is suffering due to your string length. It seems to me that it would be impossible to do a feed the sun 1-2-3 with such a length string, since a 1D sun would just hit your arms. I could see how a 2D sun would be possible. I guess all of us who are waiting for a FTS 1-2-3-4 will have to wait until the string gets a little shorter. Of course, I can only do a FTS 1-2, which isn't very impressive, so I may not know what I'm talking about. You may be able to modify your 1D sun, but the way I understand that a sun is performed is that it goes between the arms. You could modify it to a priolett (mispelled, I'm sure) or something else. In site swap terms, you could do anything that keeps the diabolo on the string and it would be considered a "1". If I am being totally ignorant of the facts, please let me know. I dont think ive ever seen ofek do feed the sun 2-3, nevermind 1-2-3 and your mad if you expecting fts 1-2-3-4 anytime soon, i dont beleive anyones landed a 4 low sun yet and if they have there keeping it secret. Mad is fine. Maybe I'll be the first! Seriously, though, I'm not sure it could ever be done consistently. I'm not sure how the diabolos would all fit on the string without hitting each other. It would definitely be an insane trick! I'm sure somebody will be able to do a trick similar to what William Ling did at BJC 07, except with 4D. I'm talking about the one where he was doing suns with two and would pop one in the air right before he caught the third one. During the trick there were never really three diabolos on the string, except at the start and end, but there were three diabolos in play, since the third one was always in the air. I'm sure someone could do the same with 3D suns while the fourth is in the air. It would be really crazy, but since 3D suns are possible, I don't see why you couldn't keep popping one in the air right before catching the 4th one. You mean 42*?!? and so you suggest a 53*? Yes that might be possible, but it'll be crazy hard. i think there are a few people who could do it, but it hasnt happened yet. I was expecting something kinda a bit crazier seeing all of your other videos, I'm sure this is hard but it just didn't appeal to me as much as your others. And PLEEEASE let the surprise actually be a trick this time! No, people are talking about 53* (note the star). i.e. throw a high throw and do a 3 diabolo sun underneath.